To examine a particular feature, attribute, asset, performance, and function, there are tools which exist to help us adjudge these things. 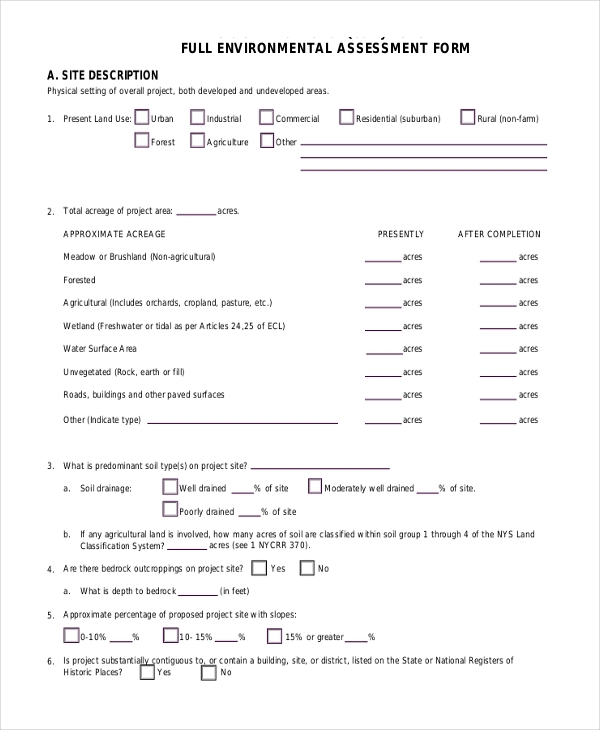 One of the tools used very commonly is assessment forms. They are very crucial. The information and data listed in these forms are most often very accurate and meticulously studied or reviewed for various purposes. Assessment forms are heavily utilized in many work cultures and environments. 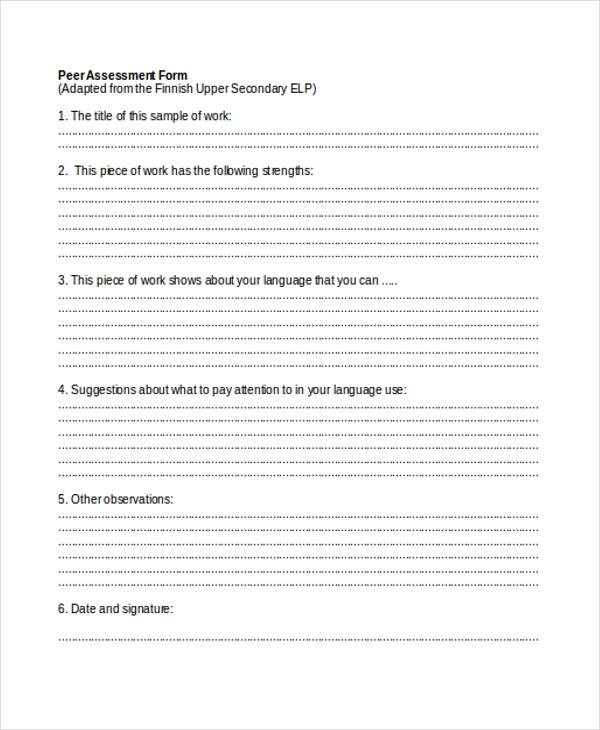 There are several types of assessment forms available and widely used. A behavioral assessment form is used to examine behavioral functions. This could be for medical reasons, academic purposes, employment etc. Depending on the purpose, the nature of questions and overall format of the form is determined. In case a technical feature needs to be assessed, a capacity assessment form is brought into play. The format of such a form is very simple and straightforward. The document contains multiple queries and questions and there are corresponding blanks given where the answers need to write. Many companies which deal in providing technical services, they provide customers the provision of conducting damage inspections periodically on the products purchased. 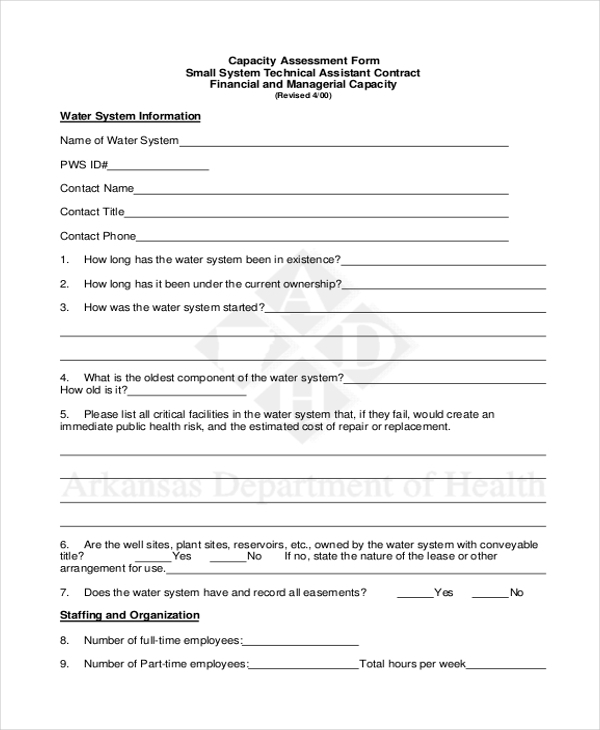 In this scenario, a damage assessment form is used to fill and file. Time and again, the government and the private companies invest time and energies in conducting employee assessments on different occasions for a variety of purposes like salary appraisal, performance review, etc. In this case, an employment assessment form comes handy. In order to examine and know whether a particular individual’s behavior is in good shape or not. 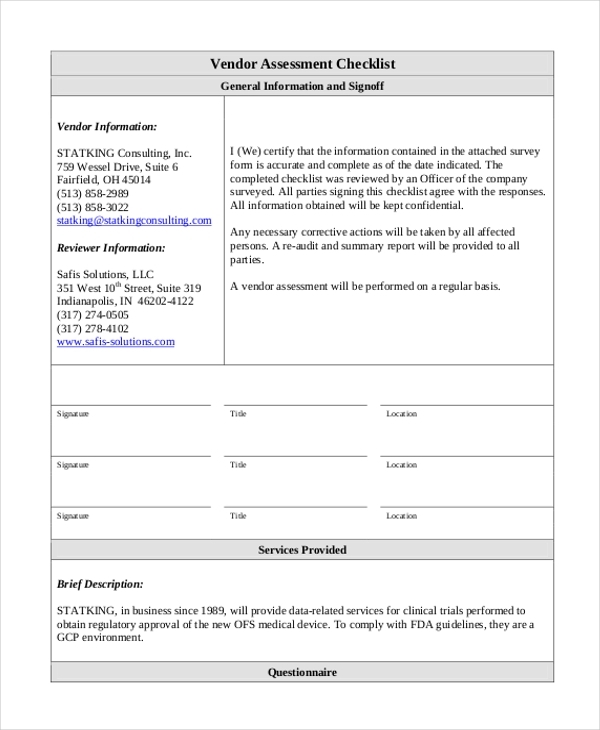 Companies, clinics, and specialists are known to use functional behavioral assessment form wherein the behavior of a person is marked and remarked on the basis of different parameters. 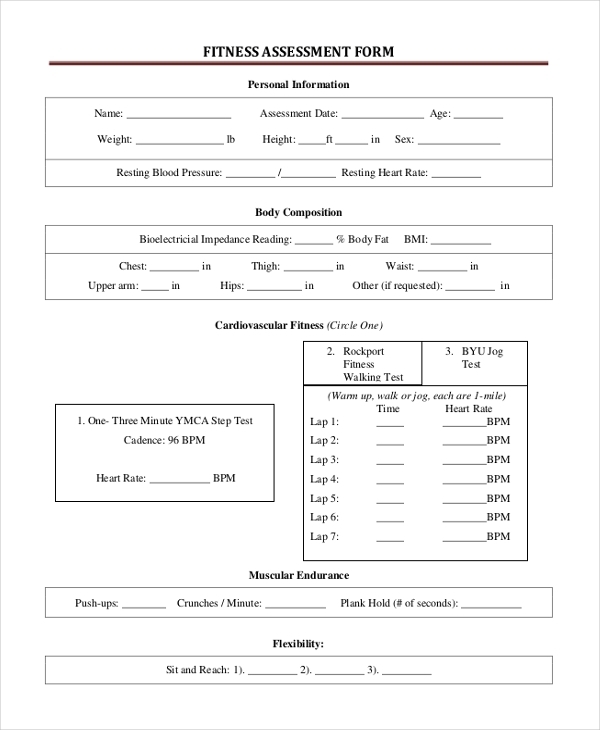 Fitness assessment form is essentially used to gather information about a person’s bodily health. 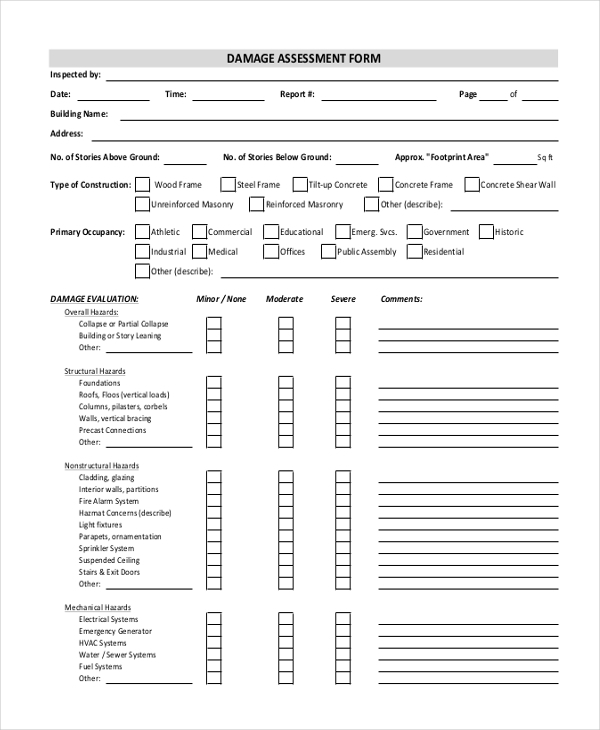 Generally, a fitness assessment contains different parameters which need to be tested, reviewed and the findings need to be included in this form. 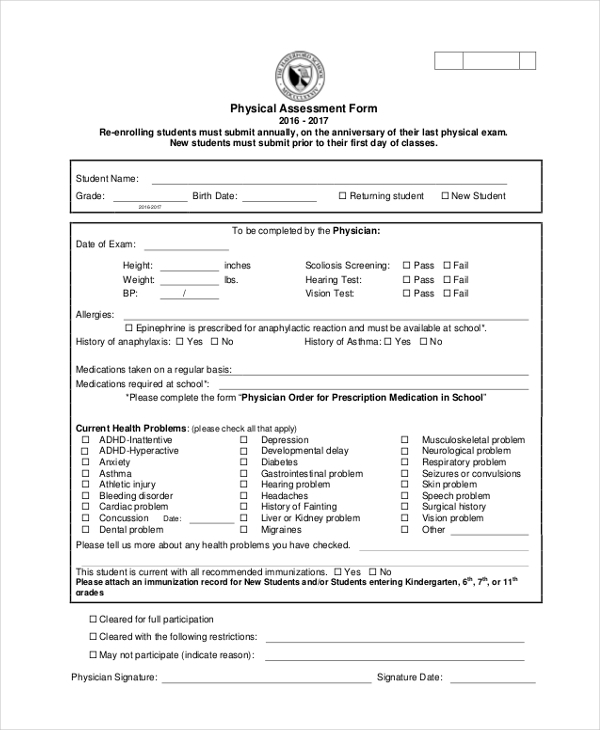 A health assessment form is ideally filled and filed by physicians and doctors. 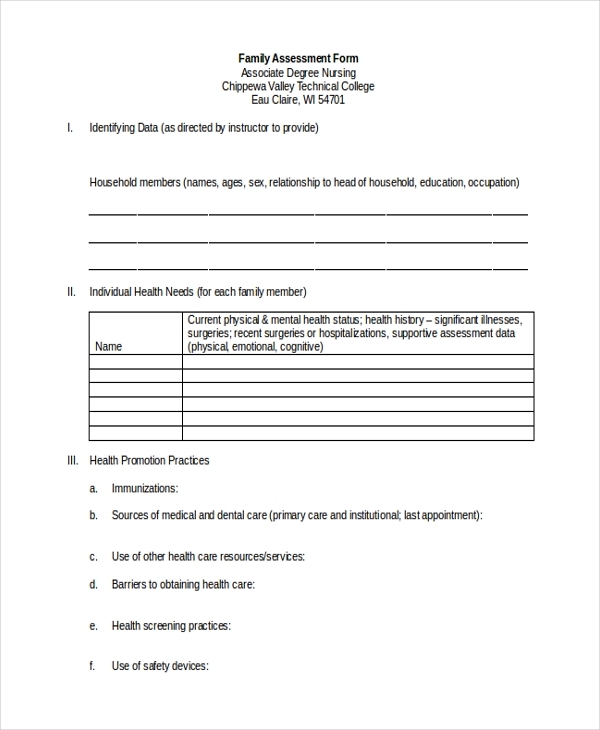 This form is used to examine the overall health wellness of a patient – mental, physical and cognitive. 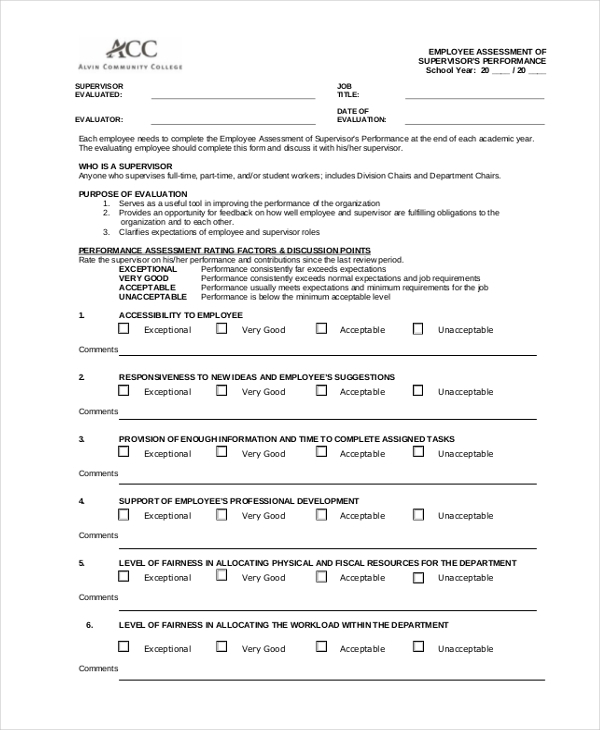 During an interview or post-interview, interviewers must fill up an interview assessment form to examine and understand if a candidate is eligible for a particular job profile or not. The remarks populated in the form determine if the candidature is positive or not. In case an applicant wants to receive financial aid or seek benefits of another financially-benefitting scheme or program, authorities will only proceed after a thorough financial assessment is done and reviewed. 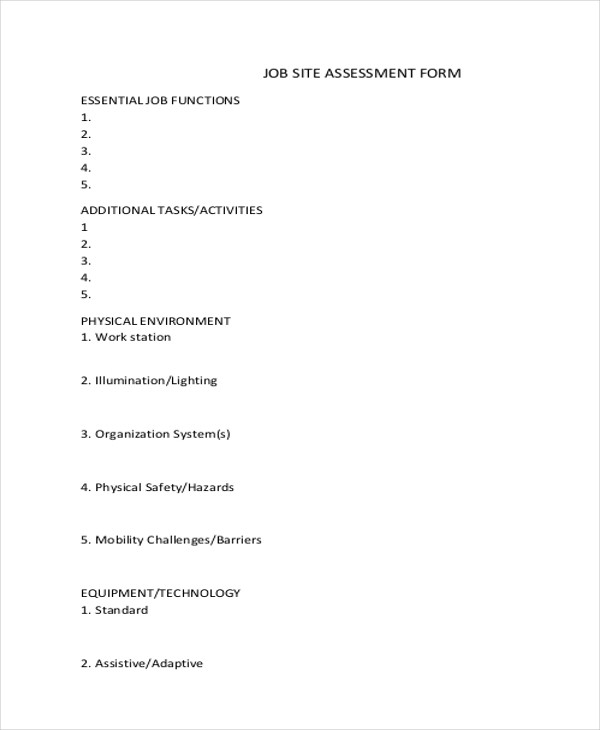 A job assessment form is an ideal bet when a particular job or job site needs to be inspected and assessed for eligibility. A range of sub-headings are included in this form which needs to be filled with accurate details. 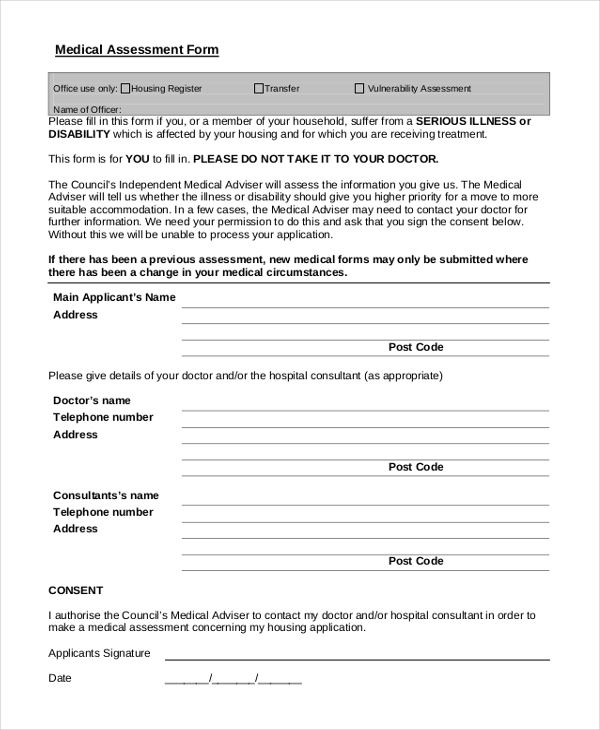 A medical assessment form is useful in a variety of scenarios. Whether it is to adjudge illness of a patient or determine that a recipient suffers from a medical disability, either of which makes him liable to receive certain specialized beneficial services. If a particular needs to receive special medical services for their condition and has a coverage that makes him or her eligible for special Medicare services, the claimant is required to furnish all relevant information with accuracy in such a form. Students, Employees, and targeted participants are required to present for a physical examination. The results of the same are populated accurately in a physical assessment form. 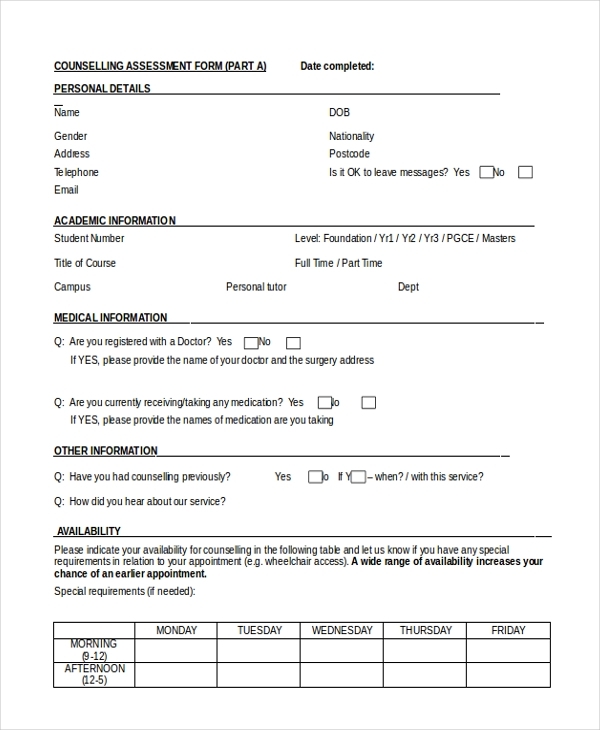 This kind of form may be used by doctors and other specialists for their patients. 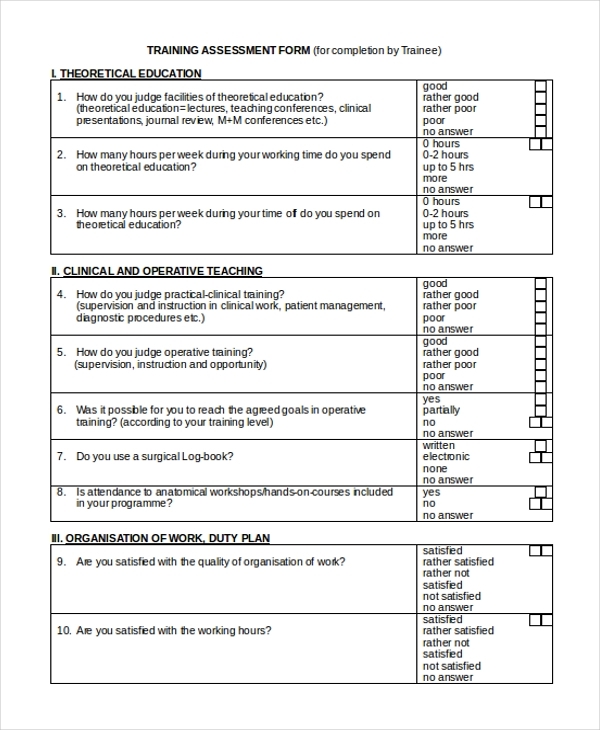 A peer assessment form is used to scrutinize the development of or lack of certain skills in a particular subject after his or her participation in a certain task. It could be a corporate, academic, clinical, medical or general endeavor. If there is a certain level of risk which is or may be involved in an endeavor or task, compiling and completing a risk assessment form provides all the data and information about risk factors and allows people in-charge to take necessary actions to remove or cut down the risk levels. 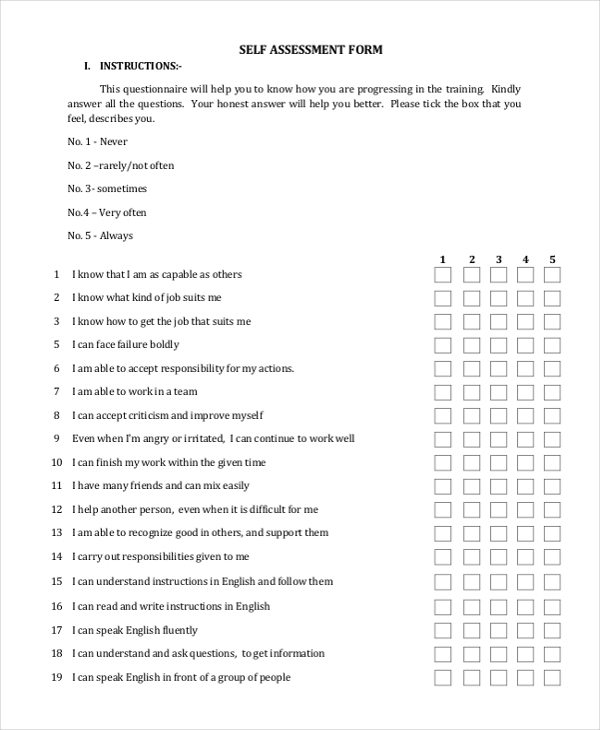 After training program is completed, participants are usually asked to fill up a questionnaire for self-assessment. The form is to be filled by participants themselves, scoring their personality, self, behavior and other concepts. Post-participation in a training session or a program, trainees are given training assessment forms to give their feedback and views on the training and its aspects, which they were involved in. 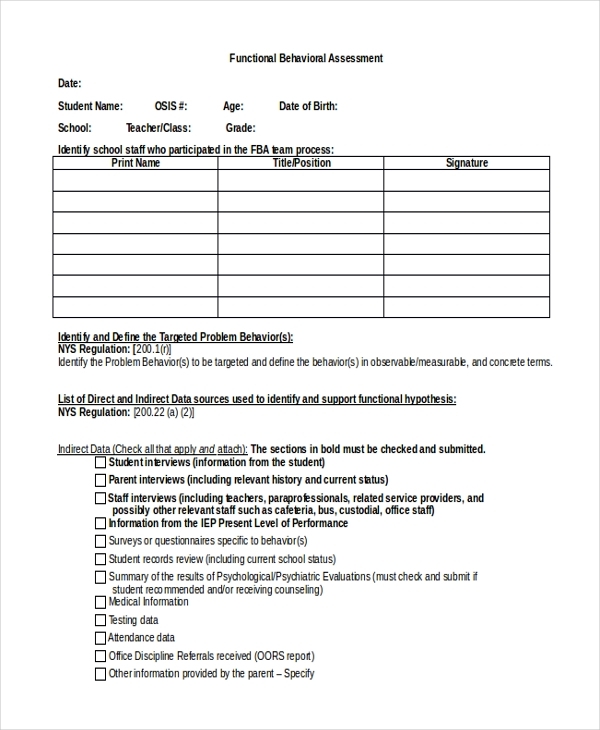 Whether it is for recruitment or appraisal or just yearly review, teacher assessment forms are used by schools, universities, and other educational institutions to rate or score the performance of a teacher year-end or semester-end. 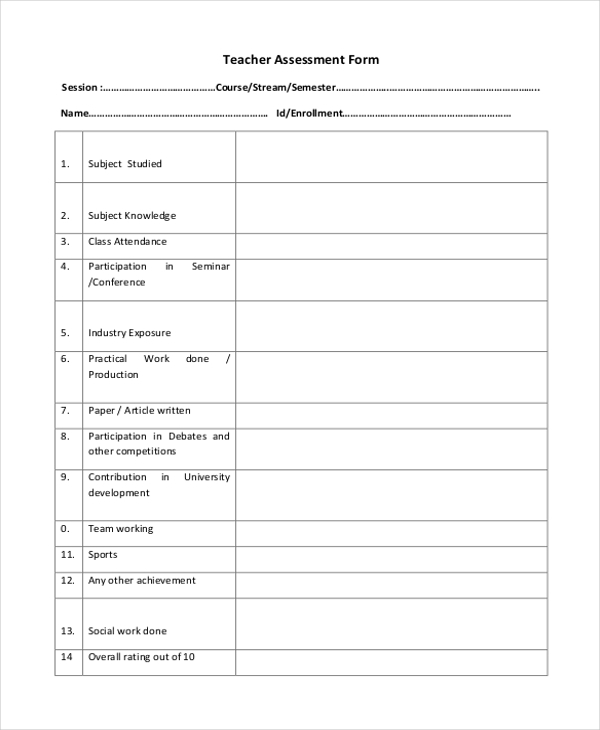 A vendor assessment form is used in settings and times when a company has to or wants to examine the performance of a vendor in terms of the quality of services or goods which he may have supplied to the company over a period of time. In the case of new vendors, assessment is required to test their authenticity. 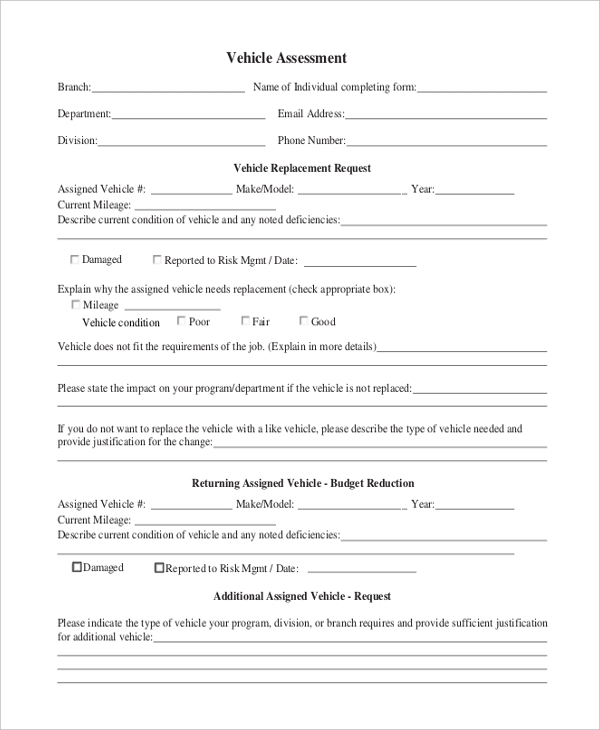 If a vehicle needs to be subject to repairs or replacement, a vehicle assessment form needs to be filled in order to furnish all details pertaining to the condition of the vehicle. After a driving, the student has successfully completed training. 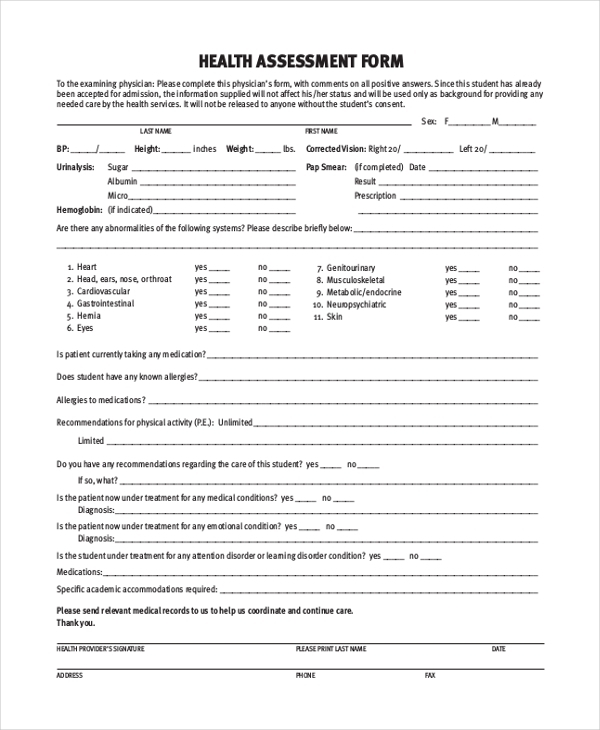 The certified assessor needs to fill up a form scoring the student’s driving prowess and skill. In this scenario, a driving assessment form is used. In case you plan to apply for an insurance cover for family or have them participate and become members of a discounted social or health program, your family would call to sit and through check a family assessment. 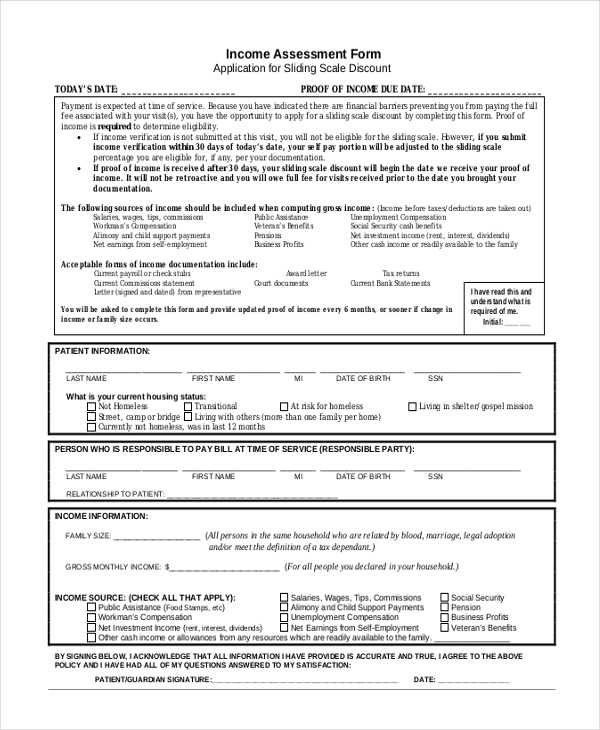 Prior to signing up for certain services, authorities requires applicants to be financially assessed to understand and be sure of whether the applicant actually requires the services they have filed an application for. Different indicators of financial health are listed on the form and need to be populated with accurate information. A lot of work-related tasks and activities are heavily populated with hazards and risks. 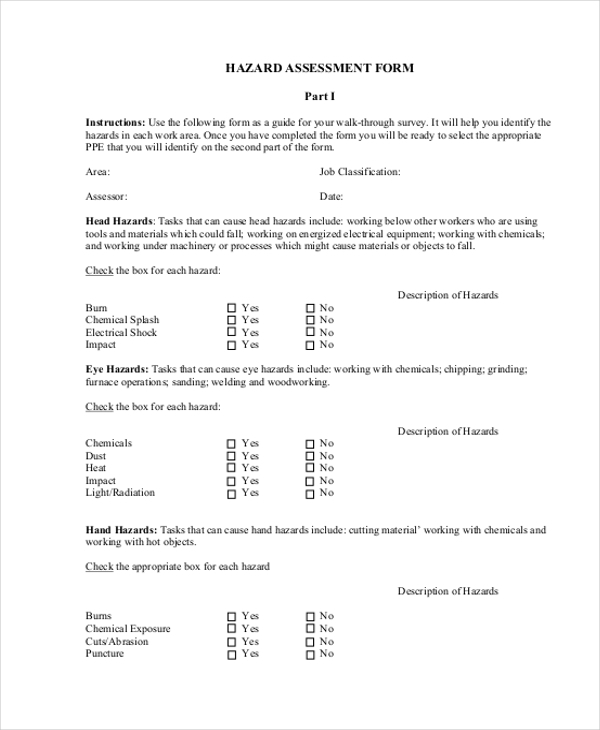 In order to minimize or remove the dangers completely, a hazard assessment form is used. Whether it is to do with chemical hazards or dangers of another kind, hazard assessment forms are the best way to know, review and act! 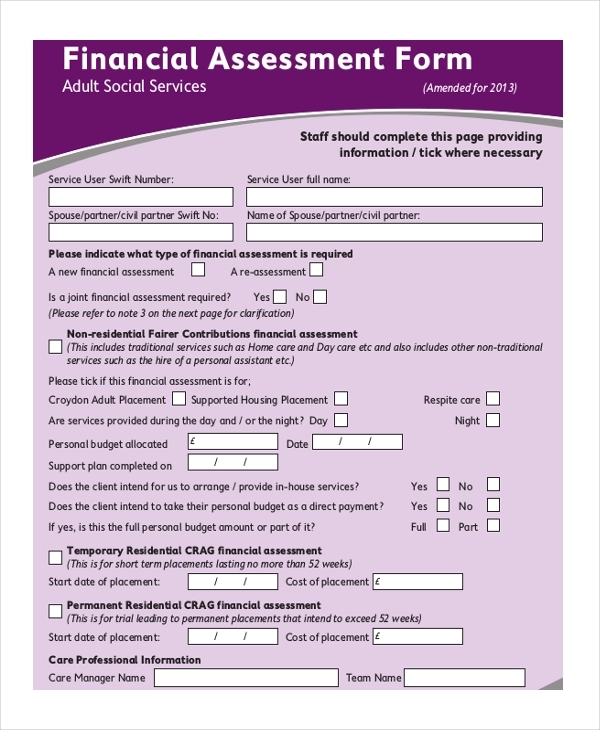 Assessment forms are usually used to examine a particular subject’s data and understand whether or not he or she is eligible or participating, undertaking or signing-up for a particular, job, task or endeavor. These forms are also used as yardsticks of performance judgment in the case of employment, salary appraisal etc. The data present in assessment forms must be accurate in order for the right decisions to be made – in or against the favor of the person to whom the assessment form belongs to. 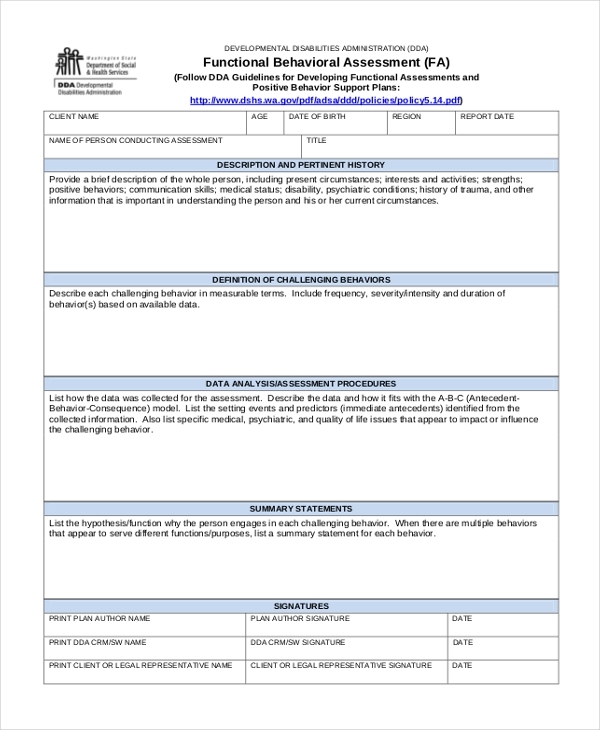 The target audience of assessment forms is varying and wide-ranging. Depending on the scenario and purpose, the target audience of forms is decided. Also, some assessment forms are versatile. 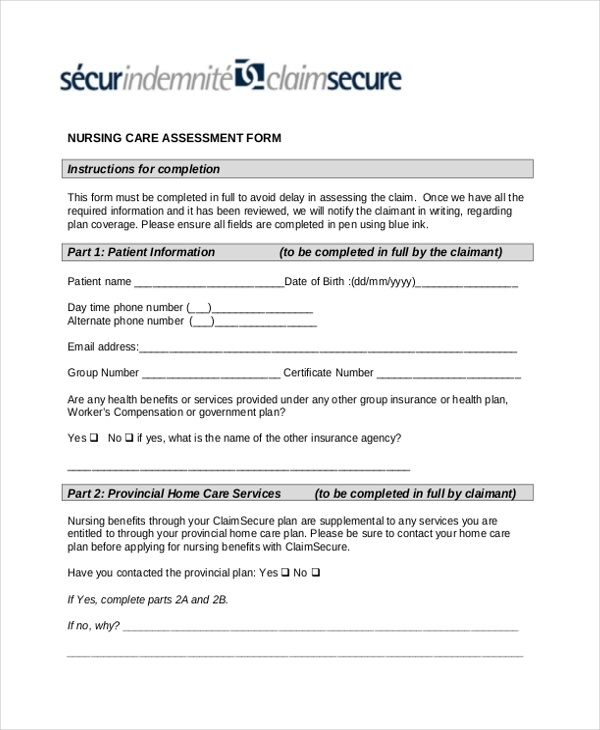 For example, if a health assessment form is being used, it could be used for patients, employees, workers, parents, children, students etc. 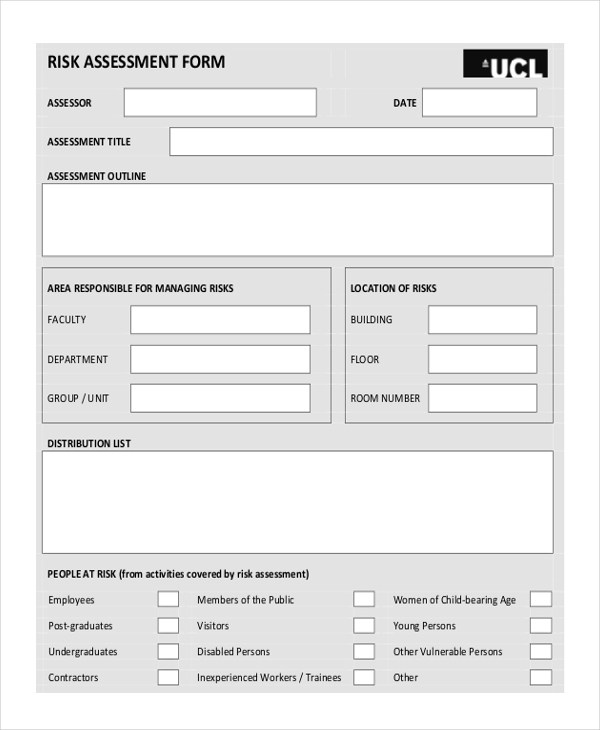 Targeted assessment forms – such as employee assessment forms will be used for no one except company employees. The biggest plus factor of assessment forms is that there is a certain high-level of authenticity and seriousness attached. When populating an assessment form, the assessor ensures that remarks and commentary are being specified in the form is true, credible and genuine. The specifics provided in an assessment form are largely accurate and precise, and the information can be utilized in many different ways. Assessment forms are important because they are credible yardsticks which are used to determine a judgment or decision on a particular matter. Be it problem-solving or improvement or something else, we can always count on assessment forms that are used in all scenarios, settings, situations, circumstances, and environments.